With just two days to showtime, the most pampered dogs in the country continue to roll into the New York before for their moment in the spotlight. This year, 2,552 dogs from 170 breeds will vie for top dog at the Westminster Kennel Club Show, which kicks off Monday night at the Garden. At the Hotel Pennsylvania, across from the Garden, two giant mastiffs were among the dozens of four-legged guests seen checking in to their digs last night, where doggie concierge Jerry Gromyck makes sure everyone is cared for. Since most of these pampered showdogs don't dare do their business out on the street, many were seen making their way to the downstairs "lounge" to relieve themselves on fake fire hydrants and saw dust before bedtime. Meanwhile, up on the 18th fl., Dr. Ruth Westheimer joined hundreds of folks who came out for a pre-show fashion show put on by Skybark. The LA-based company hosts parties in venues where people can bring their dogs. There were plenty of chihuahuas and maltese on hand dressed to the nines. Doggie seamstress extraordinaire Ada Nieves hand-stitched dozens of costumes worn by a lineup local New York Celebupus, including her own four chihuahuas. Karen Biehl and her chihuahua Eli, and Jorge Bendersky from Bravo series "Groomer Has It, were among the crew that strutted down the red carpet to benefit the Animal Haven Shelter. Nieves, who organized the event, took us backstage to check out her rack of costumes. Whether or not you you enjoy dressing your pooch, she really does a fabulous job and puts a lot of love into each one of her creations, ranging from tiny tuxedos to a floor-length wedding gown. The party was doggie mayhem but everyone was pretty well-behaved. As far as Skybark goes, the spread wasn't so impressive; pretzels and cheese scattered about with a cash bar on top of the $65 ticket price. One just hope it all goes to a good cause. The person I found most intriguing was the photographer who could be heard barking, meowing, chirping and making all sort of wild noises in an effort to get the dog to smile on red carpet. The next few days promises to be colorful. If you can't make it to the show, check out the Hotel Pennsylvania, across from the garden. It gives you a peek into a world that really is just like "Best in Show." Welcome animal lovers! Animal Outpost provides a daily round-up of news, events, and issues relating to creatures of all stripes, with an emphasis on raising awareness of needy animals. In addition to heartwarming, informative and quirky tales of cats, dogs, and other companion animals, we'll also highlight issues relating to protection of wildlife and farm animals. Please feel free to share comments, tips, stories, fundraising events, your own photos, and breaking news at animaloutpost@gmail.com. Too Wild to Live at Home? The End of Pet Store Puppy Sales? 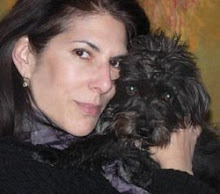 Chimp Owner, "I Did Everything I Could Do"
A long-time animal lover, Amy writes the weekly Critters column for the NY Daily News and reports on topics from animal issues to health and business for various publications. A graduate of Columbia Journalism School, she has a nose for news and sharing a good scoop. She's also passionate about animal welfare, and hopes to raise awareness of the plight of needy animals so more people will choose adoption over buying from pet stores. She lives in Greenwich Village with her rescued mutt Ruby, cats Sammy and Oscar in addition to her two-legged partner George.